OERL currently has over 150 examples of data collection instruments. You can borrow or adapt complete instruments, scales, or even individual questions to pilot and create instruments that are tailored to your own evaluations (except for the few instruments that are copyrighted). 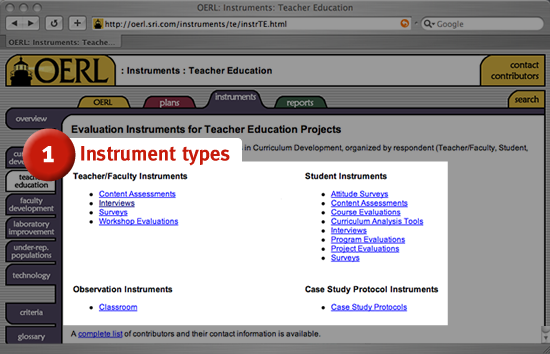 For every project type (e.g., Teacher Education), you'll see lists of instrument types (e.g., Content Assessments), categorized by their intended audience (Teacher/Faculty or Student) or purpose (Observation or Case Study Protocol).